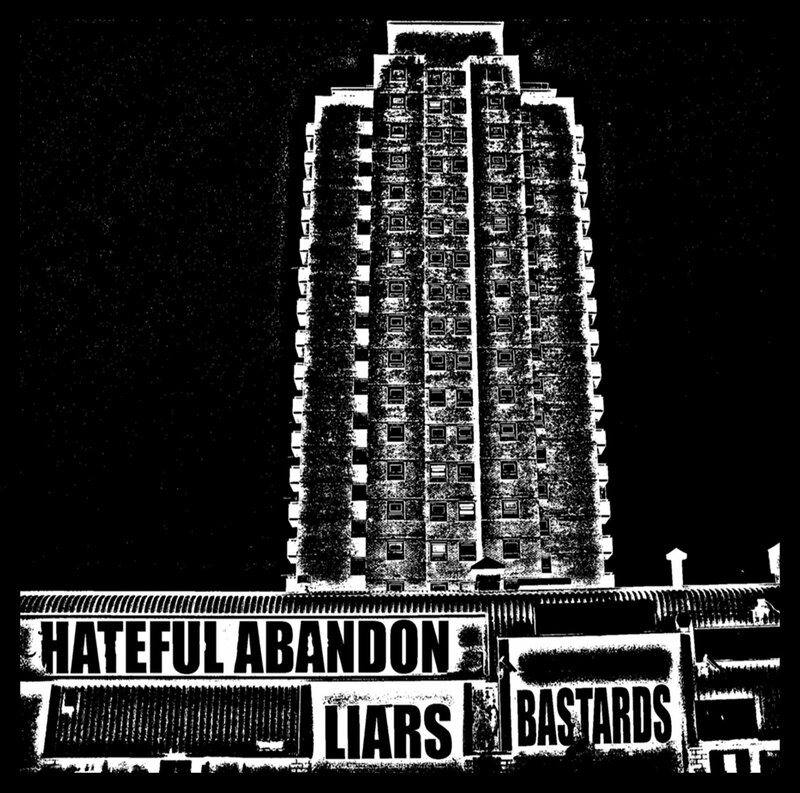 The word “atmospheric” is overused in music reviews, especially by yours truly, but it is rarely more appropriate than with Hateful Abandon’s third full-length release, Liars-Bastards. Hateful Abandon do atmospheric by the bucketload and a great deal more than they do metal, which may not please some visitors to this site. However, Liars-Bastards is well worth investigating if you fancy something different and a little unusual. Hateful Abandon formed in 2004 and consist of two members, the strangely-named Vice Martyr and Swine. Their music is difficult to describe, combining elements of atmospheric, electronic and with industrial genres. The band’s influences apparently include “old black metal”, which is imperceptible across Liars-Bastards’ seven tracks, although they also list Killing Joke, Godflesh, Amebix and the Bladerunner soundtrack, a combination of which may not be a million miles away from what they produce here. It’s certainly not standard Metal Observer fare, with very occasional guitars, the odd drum beat and scattered, howled vocals only the vaguest of hints at anything resembling metal. First track “Maze Of Bastards” opens with quote from George Orwell’s 1984, “If you want a vision of the future, imagine a boot stamping on a human face – forever.” The rest of the track combines despairing howls, repetitive military drumming, deep backing vocals and keys best described as sound effects. The Bladerunner reference seems really apt, as this would be ideal for a sci-fi soundtrack, with alien forces preparing themselves just before an attack. “Culprit” follows and although it could also come from a soundtrack, that is where the similarity ends and it would be a very different film. It starts as a bubbly dance tune, which could be theme music to one of those early Atari console games like ‘Pac Man’ or ‘Dig Dug’, which is later joined by catchy, moving keys. Yelled, despairing vocals follow, then piano, upbeat, jaunty keys, which are joined by a great guitar riff…. it probably sounds like a mess from this description, but it comes together superbly and stands out as the album highlight. Each track is unique, using different elements to create disparate moods and this makes it difficult to review without describing each track in detail. What can be said about a number of tracks, though, is that they have plenty of atmosphere, but are often repetitive and occasionally feel as if they should develop into something more. “The Walker” is a good example, featuring some nice keys, sombre sound effects and authoritative vocals that sound like a speech from a Christopher Lee horror film character, but it continues on the same path for too long. “December” is minimalist yet moving, something of an epic at ten minutes in length and would be ideal for the bleak soundtrack to a film such as Moon. Dredging up that soundtrack comparison yet again probably sums up Liars-Bastards best – it makes great background music. It’s good throughout, but you probably need to be doing or watching something else while listening to it. Bits of music here and there are brilliant, but only one piece (“Culprit”) truly delivers all by itself, living up to its potential and standing up to repeated listens without the need for distractions. When Hateful Abandon are on top form like this, they brings to mind soundscapes created by the likes of Philip Glass and Future Sound Of London. Liars-Bastards shows a lot of skill, creativity and may provide a welcome distraction between doses of extreme metal. This entry was posted in Reviews and tagged Amebix, Bladerunner, Bristol, Candlelight Records, England, Future Sound Of London, Godflesh, Hateful Abandon, Killing Joke, Liars-Bastards, Philip Glass. JB is an ageing, overweight death and thrash metal fan, as well as enjoying various other forms of heavy metal and hard rock. Favourite bands are Bolt Thrower, Death, Testament and Orphaned Land. Has an unhealthy obsession with guitar solos, which is reflected in most of his reviews.